Touristplacesinindia offers complete information on the islands of Maldives, Maldives Tourism, Tour Packages for Maldives, Hotels in Maldives , Maldives Travel, Maldives Tour, Places to see in Maldives, Places to stay in Maldives, Tourism in Maldives, Travel to Maldives ,Visit Maldives. 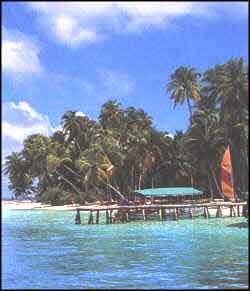 Maldives is located on the equator, at the southwest of Sri Lanka. The island stretches 820kms from north to south and 120kms from east to west. It comprises 1,190 coral islands among which 87 are exclusive resort islands and 202 are inhabited. 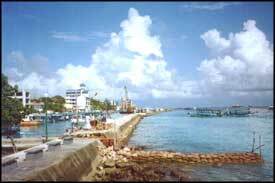 The climate here is generally warm and humid and all throughout the year, you can find the sun blazing here. This makes it even more appropriate for those travelers who want to soak up the sun and spend a lovely time, enjoying the beaches. For those who love to spend time, doing underwater activities, for them travel to Maldives, can be an ideal form of recreation. Divers and snorkellers can experience absolute heaven here and it has emerged as a great diving destination. Diving at Maldives is an absolute delight because the temperature is favorable here too. All throughout the year, you will find warm temperatures at Maldives, which has made it ideal for some of the best diving sites of the world. If you are keen on surfing and searching for an ideal destination to pursue your fantasies, then Maldives is the place for you. Majority of the surf breaks at Maldives are in Male Atoll. if you are interested in resort based surfing, you can select one of the resorts on the eastern side of North Male Atoll. Maldives is fast becoming a hangout for the surfers, which is evident from the recent O'Neil Deep Blue Contest, organized here. Fishing at Maldives is fun. It is not only the backbone of the economy of Maldives, but also largely popular among the locals as a favorite pastime. Different types of fishing are practiced here. Most popular among these is the night fishing. The boat usually leave the islands before sunsets and when the darkness is on the verge of setting in. if you do not get a good catch, you can enjoy quiet moments at the boat, rocking slowly with the waves. On the other hand, Morning fishing or Big game fishing is undertaken only on requests. During your Maldives tours, you should miss out on whale watching. In fact this place is among the top five places on earth for watching dolphins and whales. You can find more than 20 different species of whales and dolphins here which range from the Blue Whale to the smaller but acrobatic Spinner dolphin. Spinner dolphins are in plenty here at Maldives. Many resorts at Maldives offer excursions to see the Spinners in the morning or afternoon. The best part of Maldives is here you can watch the whales in their natural environments right here. Touristplacesinfindia.com can provide you more information on Maldives and other tourist destinations.